There's barely room for 40 souls and the decor amounts to the tools of the job: bare-back tables and bentwood chairs; a cool marble bar and espresso machine. At the back is a bookcase full of wines, but all the focus is sucked to centre stage: a spotlit plating station, anchored by a charcuterie slicer that gently thunks through cured meats. 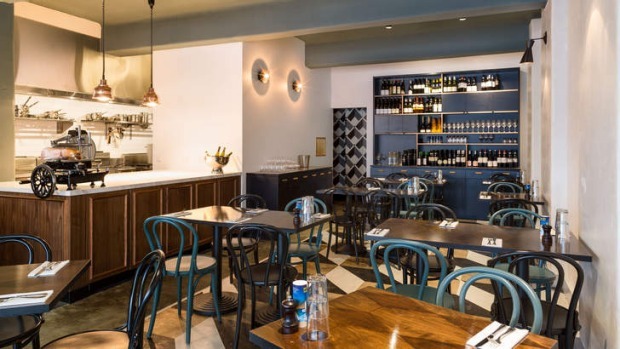 This is Tipo 00, a tiny new pasta bar on Little Bourke Street, which serves as a potent reminder that eating spaghetti – the good stuff, crafted by talented chefs with their focus honed tight – is still one of the best experiences this city can offer. It's what's makes the likes of Il Bacaro, Di Stasio or Rosa's Kitchen endure in a city so fickle that two years amounts to a good innings. 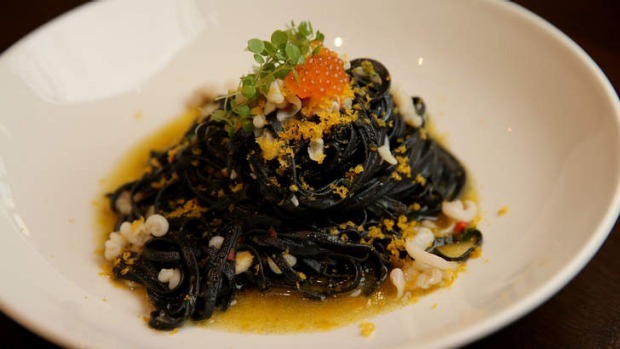 Walk in to these establishments, however, and you're guaranteed to find the city's fiercest eaters, sated and sedated, face down in a bowl of carbs. Tipo, more refined than rustic in looks, and equally direct in its offering of hand-made pastas, offal and interesting wines, joins those ranks with scary ease. Behind the bar, gently thrusting forth the Cocci Americano (an easy-drinking vermouth) to all who enter is Luke Skidmore. You may recognise him from Saint Crispin. If not, he's the guy who looks exactly like Eric Bana. Skidmore runs front of house with a practised hand, disseminating the information you need and hanging back just enough to let you decide if you want to engage or get lost in a rose alone. That's easy to do. The wine list ticks a lot of the trailblazing boxes. There's the bright and malleable Filippi soave, good for whatever ails you and matching almost anything you want to eat. Or go for the ballsiness of the '11 Mastroberardino greco di tufo from Campagna. It's almost got a herbal thing going on, and has as much swagger as the plates it backs. In the kitchen are chefs Alberto Fava, who's proven his chops at Merchant and Scusa Mi and Andreas Papadakis, co-owner here, who clocked serious time at Vue de Monde in the past, and more recently can be found revolutionising event food through his theatrical catering business Comida Bebe. Now the pair are kneading dough and making offal a meat of the people. Neither chef has lost steam in turning their attention to Italy's staple carb. The high level of skill is evident from the get-go in a salty baton of soft-and-crunchy focaccia, striped green with olive oil and served with soft mounds of fresh ricotta. So too with ox tongue, poached, shaved, gathered on skewers, then lightly grilled and delivered in ruffles on the plate with a balsamic reduction and pink peppercorns. It's offal for the faint of heart – more like corned beef, supercharged with fruity pops from the pepper. You could up your staunch points with the calf liver, but only just. It's iron-rich and soft, sure, but it's totally disarmed by sweet, vinegary and sticky onions. Ugly deliciousness at its best. There's a restrained confidence to this food. Octopus, braised soft and bedded among slippery, buttery beads of Israeli cous cous and parsley, presents as lacking acid, but then a sweetness reveals itself, slowly but surely. And then there's the pasta itself. Pity the carb-hating fool who will never know what it is to break into the perfectly-formed tortellini, shiny with browned butter and capturing its parmesan, sage and asparagus goo. Pappardelle ribbons are thicker than you might expect, but give you the resistance and solid bass line you want for the tender shreds of braised rabbit, toasted hazelnuts and perfume bursts of fresh oregano. It probably has the upper hand flavour-wise over the spaghetti with clams and gently smoked cherry tomato bombs, but you can't really lose whichever way you go. The nettle risotto hits every note – it's creamy, nutty, grassy from the nettles with salty, crunchy and floral bursts from a scattering of fried samphire and more of the pink peppercorns. Back it all with some gently dressed leaves and bitter radicchio and you've got the definition of balance. Tipo 00 is the kind of restaurant that breeds an instant following. The soundtrack is a decibel-soft rendition of Marlena Shaw's California Soul, and although you can book, you don't have to. It's a formula that works. 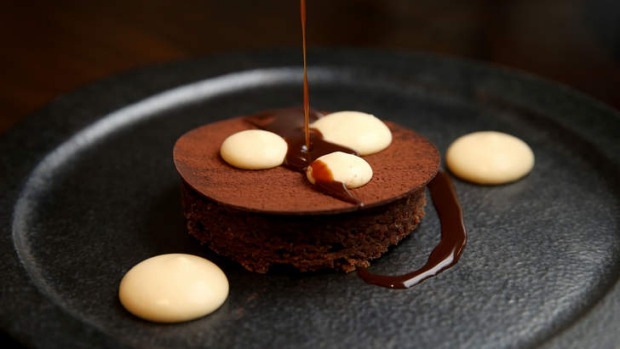 At a month old, half of the bar seats are taken by solo diners – off-duty chefs mixed with tired Collins Street office workers offloading stress to Skidmore/Bana over plates of Tipomisu (a fudge-like ring of cake filled with mascarpone and chocolate caramel with an intense coffee hit). If their mission here was to provide comfort and tastiness with polish, they've nailed it.